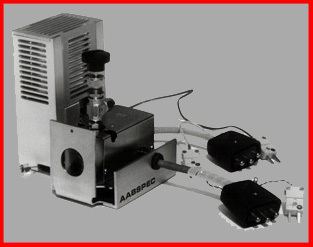 The AABSPEC EGA/500 system allows the spectroscopist to directly examine vapors released from samples at various temperatures. The new technique of Direct Evolved Gas Analysis/ FTIR is very powerful and provides the spectroscopist with important information. Otherwise difficult or impossible problems are quickly and easily solved. Applications of the new system include Thermal Stability of Materials, Contamination Studies of Raw Materials, Component Failure Analysis, Head Space Analysis, Environmental Monitoring of Atmospheric Pollutants by desorption from Activated Charcoal. The EGA/5OO essentially consists of two parts. The first is a high performance low volume light-pipe (AABSPEC patent) which is gas tight and fitted with a valve so that it can operate as part of a closed system or in a flow-through mode. The second part of the system is a separately temperature controlled sample chamber which is connected to the light-pipe. Sample temperatures of up to 500degC or 700degC can be obtained and sample volumes of up to 5 ml can be accommodated. The result is a very high sensitivity (ppb) system which can identify and quantify very small amounts of vapor as it is released from the sample. The sample chamber can be evacuated, gas filled or continuously purged with a selected gas. Heating rates and the timing of the heating process are fully controlled with an AABSPEC Linear Temperature Programmer. So a wide variety of sample test conditions are available. To illustrate some of the applications of the system, a series of test samples was run in the EGA/500 using a standard Mattson Cygnus FTIR fitted with a wide band MCT (B) detector. The EGA/500 was simply mounted in the normal sample compartment without any additional optics. Spectra were recorded at 8 cm-1 resolution taking 32 sample scans. See the new products section for imformation on an updated version of the EGA/500 system.